On arrival at the Kigali International Airport you will be met and transferred to the Gorilla Mountain View Lodge. Overnight on full board basis. 0700 hrs: Arrive at the park headquarters for registration ‐ a simple process where the park staff asses your fitness level to determine which Gorilla Family you will visit. Thereafter, the park staff brief on trekking times and conditions to the various groups based upon their location in the park. Gorilla Trekking……. 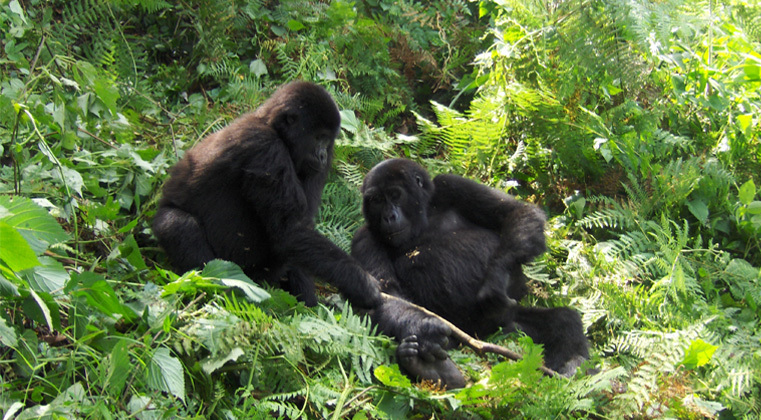 There are a total of 80 gorilla permits available each day with a maximum of 8 trekkers visiting any one group. Treks vary in duration depending on which gorilla group you are assigned to. After locating your assigned gorilla group, you will spend approximately one hour in their company before heading back down the volcano slopes. Overnight at Gorilla Mountain View Lodge (B,L,D). Either go gorilla tracking again – additional permits required, subject to availability- or opt for one of the other, gentler but equally rewarding alternatives available (see above). have en-suite facilities, a small lounge with a fire place and a private veranda. The cottages are of a good size and are well positioned to give them privacy from each other. There is a separate restaurant and bar area where meals served to the guests. Mountain Gorilla View Lodge provides good value for money at the same time as great views and easy access to Parc National des Volcans. Located very close (about 15 minutes) from the main headquarters of Rwanda’s Volcanoes National Park (Parc National de Volcans), this is a very handy base from which to explore the area and organise treks to see the Golden monkeys and, of course, the mountain gorillas. This is a great location with superb views of the volcanoes.The lodge grounds are very well maintained and from here there are beautiful views of the volcanoes. Electricity and hot water are currently supplied by a generator which does not run all day but this may be changed to mains power very soon. The central area has a basic bar and a restaurant. We would advise you to you to dress warmly for dinners during the winter months. Stay here for the great location and super views without the need to breaking the bank. Food is generally, good home cooked fare. Gorilla tracking, Golden monkey tracking and local village/cultural excursions. All airport transfers and assistance; Accommodation at Gorilla Mountain View Lodge on Full board basis; Private transport in a 4x4 tourist converted jeep; Services of an English speaking driver-guide; Bottled drinking water while trekking and in vehicle. Meals and beverages, other than specified; International, regional and local Airfares; Airport taxes; Passport and visa fees and service charges for obtaining visas; Excess baggage charges levied by airlines; Gratuities to driver/guides and other conveyance attendants; Laundry and other items of a personal nature such drinks, telephone calls ETC; Personal and baggage insurance; Cost for anything not specifically mentioned in the listing above; Insurance coverage for Baggage, Accident and Trip Cancellation/Interruption.